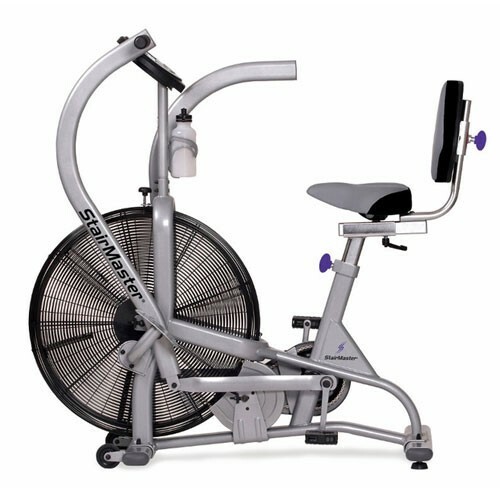 The StairMaster® Zephyr Upright Air Bike offers a robust design and features dual action wind resistance that provides a total body cardio workout. The resistance is determined by how hard the user works; the harder the bike is pedaled, the higher the resistance becomes, allowing for a wide range of users. Dual action wind resistance provides a total body workout and an upper body only workout option is available by using back pad and foot rest supports. The Zephyr has a unique, oversized cushioned seat and back pad for comfort and support, and offers a bright user-friendly LED display. It is easily transported via front wheels and has an easily accessible water bottle holder.